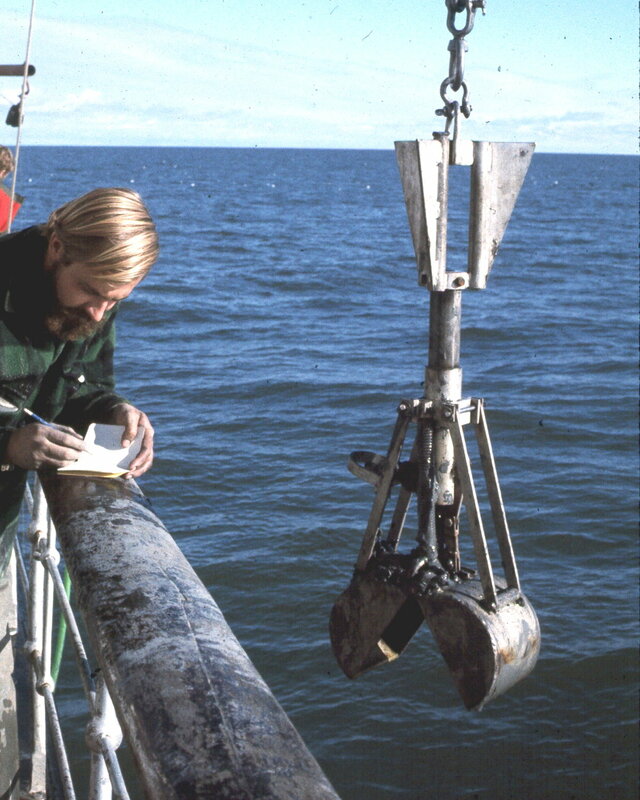 A researcher aboard the Bradbury (now in the Selkirk Marine Museum) collects surface sediment samples from Lake Winnipeg using an instrument called a dredge, circa 1969. Despite its ecological, cultural and economic importance, Lake Winnipeg is relatively under-studied compared to other bodies of water. Today’s scientists are working to change that. Research on and around the lake is ongoing, and each new finding furthers our understanding of its unique physical, biological and chemical characteristics. Scientific research also helps us understand how nutrients such as phosphorus are affecting Lake Winnipeg’s ecosystem by contributing to the growth of harmful blue-green algae blooms. At LWF, we believe good science is key to restoring and protecting the health of Lake Winnipeg. The more up-to-date, accurate scientific information we have about what’s happening in our lake, the better able we are to make smart decisions about water management. The Lake Winnipeg Basin Information Network is an online resource that contains biological and physical data about Lake Winnipeg and its watershed. Created by the federal government through Environment Canada, and maintained by the University of Manitoba with contributions from a number of partner organizations, its goal is to promote data sharing and ensure the consistent and reliable delivery of information. The Lake Winnipeg Stewardship Board Report was formed as part of a provincial action plan to help protect Lake Winnipeg; its term ended in January 2010. The LWSB’s 2006 report to the minister of water stewardship contains a series of recommendations that, together, act as a blueprint for action on Lake Winnipeg – both for governments and the general public. The State of Lake Winnipeg Report was in released in July 2011 by the governments of Manitoba and Canada, led by Manitoba Water Stewardship and Environment Canada. This report assesses the physical, chemical, and biological characteristics of Lake Winnipeg and presents the recent state of knowledge on the Lake Winnipeg aquatic ecosystem as it pertains to eutrophication. Red Zone III was held in May 2012 as part of the inaugural Living Lakes Canada Gathering. LWF’s third community forum once again brought local and international water experts to Winnipeg to discuss a broad range of issues related to the lake and its watershed, with a goal of inspiring change. More information about Red Zone III, including the agenda, speaker bios and abstracts, is available here.